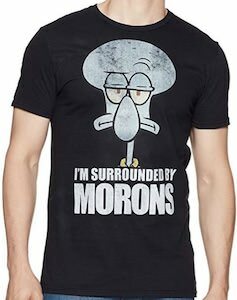 Show off the fun Squidward with a simple yet to the point t-shirt. 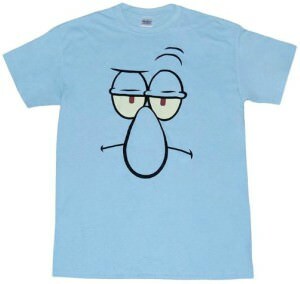 This is a t-shirt that features the SpongeBob Squarepants character of Squidward Tentacles, an all light blue octopus that stands upright. On the front of this t-shirt you simply see just his facial features of half closed eyes, frown and big nose. Made from 100% cotton giving you a very soft and comfortable t-shirt that will also be super durable to last you a long time. It is available in a wide variety of sizes that will range from Small to 3XL and comes only in light blue but that is the best color for this shirt. SpongeBob Squarepants fans all know Squidward Tentacles, the neighbor that lives between Patrick and SpongeBob in a house that looks like an Easter Island statue. And we all know that Squidward is a little bit different then SpongeBob and Patrick but that, of course, does not stop SpongeBob from including him in almost everything that he does not want to be included in. And now you can have a sticker of Squidward and not just any sticker no it is the sticker of his face with his usual happy smile (NOT). 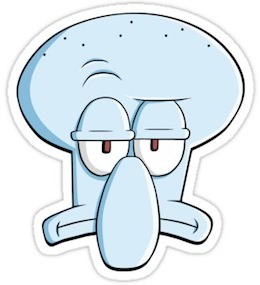 And this is a die-cut sticker which means that it is shaped like the head of Squidward Tentacles. And this sticker will love to live on almost anything from your laptop to a t-shirt or from a car to your fridge. Yes he looks like Spongebob Squarepants but no he is Spongebob Rockpants. 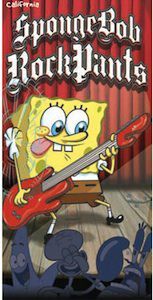 This Spongebob is a master a playing Guitar Hero and is so good that his friends Patrick, Squidward and Mr. Krabs are dancing on the music he plays. And this picture is what you see on this beach towel. No you can rock the beach with the Spongebob Rockpants beach towel. With this huge 30 x 60 inch towel you will make tons of friends while you enjoy sun and sand. Don’t wait till winter starts go get your own Spongebob Rockpants Beach Towel.